What Do Twitter Lists Say About Your Brand? Just as you tag your social bookmarks and blog posts with key words to help you and others search and sort them, Twitter’s Lists feature effectively tags the listed users. It makes for an interesting way to zero in on one piece of the social media ROI puzzle: How do other people view you and your organization? The free online List Tags tool at MustExist.com generates a word-cloud picture of how others see you, based on the names of the Twitter lists you’ve been added to — in effect, what Twitter Lists say about you. There’s no easy way to weight this information in measuring the ROI of your social media outreach, of course; there's no simple way to translate a tag cloud into a success-failure rate or growth chart. But it's interesting qualitative datajust the same. For Twitter users who appear on at least a couple of lists compiled by other users, MustExist can help you to see at first glance if your “branding” attempts are way off track or right on target. You’ll also see, over on the righthand side, a list of Twitter Lists whose names include the word most frequently used to tag you — the largest word in your MustExist tag cloud. So, it’s a nice little discovery tool, too, to help you find more people on Twitter who share your interests. MustExist List Tags is free, and you won’t even have to login to Twitter to use it. In fact, you can check out any Twitter user’s MustExist profile by adding their username to the URL in this format: http://www.mustexist.com/list_tags/username. 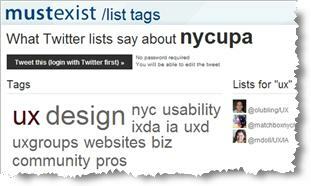 How accurately does your Twitter List tag cloud reflect your organization? Are you sending out the message you want to send, and creating the online image you desire?